#ThatBusinessShow off to another great week on this Monday show and a reminder to all if you are interested in appearing as a guest on the show, email Jamie@tampabayradio.com for more information. Sponsorship openings available too for people to become regulars on the show also. Connect with me on Twitter at Jamie_meloni and be sure to subscribe to my YouTube channel – http://www.youtube.com/jamiemeloni to view all the videos of the show! 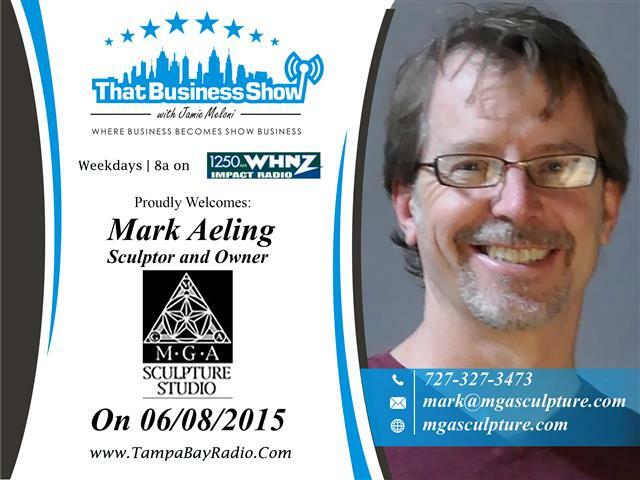 On the first half of the show, Sculptor Mark Aeling was in studio. He is the owner/founder of MGA Sculpture Studio and very involved in the Arts community in St. Petersburg. He holds a Masters Degree in Fine Arts in Sculpting from Washington University and works as a commission based sculptor now through his company. Some of his many projects can be seen around the Bay area including the life-sized bronze dolphins for the Sundial, a shopping and movie complex in Downtown St. Petersburg, as well as worked with many companies including BayCare Health Services, Home Shopping Network and Sea World as well as the City of St. Petersburg. Mark is also the founding member and President of the Warehouse Arts District Association that was launched in 2011 as a 501c-3. Mark discussed some of the challenges artists face in a community such as descending upon a blighted community only to raise the values and then force themselves and others out due to the increased values that occur. Through the Association, Mark relies on community donations and involvement to ensure this doesn’t happen in the St. Petersburg area that is now thriving with artists. The district is defined from 1st Ave N to 10th Ave S and 16th St to 31st St. As President Mark launched an initiative which resulted in the purchase of a six warehouse, 2.7 acre site to be redeveloped as an Arts Center with more than 50 studio spaces for the artist in this community. Mark is always looking for artist and investors and donations to assist with the organization and you can learn more at http://www.whereartismade.com about the WareHouse Arts District in St. Petersburg and visit http://www.mgasculpture.com for more information on his business. Mark can be reached at 727-327-3473 or email mark@mgasculpture.com! 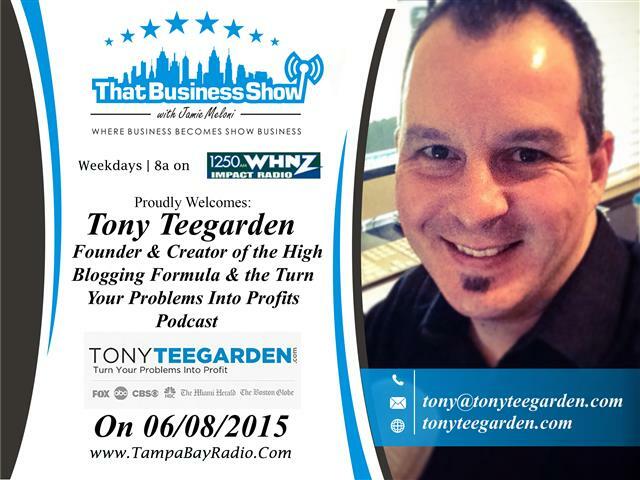 Tony Teegarden, Founder of the High Ticket Blogging Formula and host of the Turn Your Problems Into Profits Podcast available on iTunes, Stitcher and SoundCloud. Tony works with experts in their fields to leverage their knowledge and turn it into sellable coaching programs. Tony shares his story of enlightenment on this entrepreneurial path by joking about his lack of skill in dating and how his research on how to date led him to an a-Ha moment on how to leverage coaching skills into financial gain. As he delved more into this industry, he saw strong demand from people that had the knowledge but lacked the channels and presentations to get them out to their audiences for a financial gain. If you have hit a financial brick wall and feel you are not progressing, then it’s time to contact Tony Teegarden to see how he can help you leverage your knowledge and skills into more money. Learn more at http://www.tonyteegarden.com and he is available via email at tony@tonyteegarden.com.